It’s Monday, July 7th , 2014. The soulful strains of contemporary jazz artists, the Yellowjackets have long since echoed across the base of Blue Mountain. Now, the only sound that can be heard is the whir of cordless drills and the clanging of metal as a band of riggers continue to dismantle the giant main stage. 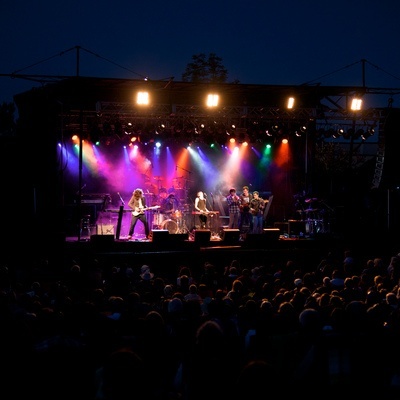 It will be another year until the 3rd edition of Jazz on the Mountain at Blue delights jazz and music enthusiasts from throughout Ontario and beyond. For them, the past weekend was more than a series of concerts and events. It was an experience they will savour through the summer and well into the fall. By December, many of the over 30 acts and 100 musicians for the 3-day event are booked. This takes hours of e-mails, phone calls, and booking arrangements to lock it all in place. Even then, surprises can happen. “I still remember the time the booker for Christian McBride called me, “ Schwisberg said. “He realized that the 3-time grammy winning bassist couldn’t come to Blue Mountain. He would be in Europe at the time!” Thanks to his wealth of jazz contacts, Schwisberg was able to call Charnett Moffit at his home. Within 20 minutes, an agreement was banged out with the iconic bassist and what could have been a problem was solved. It’s the spring of this year. A detailed marketing plan that includes radio and social media will begin to announce headline acts, special master classes, and new jazz jams. At the same time, food menus will be developed by Steve Flagler, Director of Food and Beverage at Blue Mountain Resort, to feed the 25 thousand plus people in attendance. The resort’s security department will carefully go over plans for the safety of everyone concerned while a myriad of details will be mapped out by resort and village staff. On the Tuesday prior to the July 3rd to 5th festival, riggers and technicians will assemble the giant main stage. Musicians will be greeted at Toronto Pearson International Airport, handed detailed itineraries, and transported to Blue Mountain Resort properties. Meanwhile, final touches will be applied to scheduling, accommodations, guest relations, food concessions, and sponsor enhancement. At the main stage, 12 technicians from Metal Works will be ready with sound checks, lighting, performance sound, and special staging requirements. All the months of behind-the-scene planning will be ready to greet festival goers as the incredible, musical experience of Jazz on the Mountain at Blue will once more echo across the mountain. For more information on Jazz On The Mountain At Blue and to read about the lineup of artists, visit https://jazzonfestivals.com/.